Haight Ashbury Natural Vegan Shaving Soap with Essential Oils is a men's shave soap for brush and mug shaving. It can also be used straight on the face with a wet shaving brush to work up the lather. Use with a straight or safety razor. 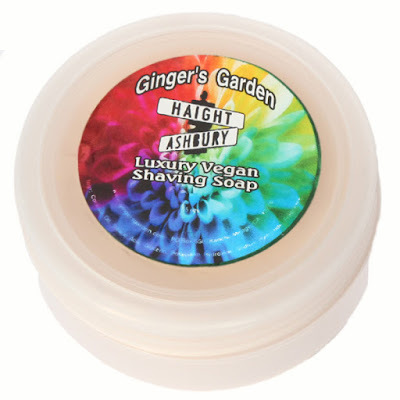 Haight Ashbury Vegan Shaving Soap is a premium luxury soap that has a well aged, dark Patchouli, French Lavender, Tobacco Absolute, Vanilla and Coconut. The Patchouli is predominant long term and in the drydown along with the Tobacco. The Lavender is light and well balanced. The Vanilla and Coconut add some sweetness. This fragrance is rich, earthy and intoxicating! Don't judge this custom blend by the first whiff. It mellows out quite nicely. If you lived in the 60's or love the 60's you will love this shaving soap!